A Little Gesture A Great Help: School Feeding at ALG! Do you know which one is the biggest ALG Project? 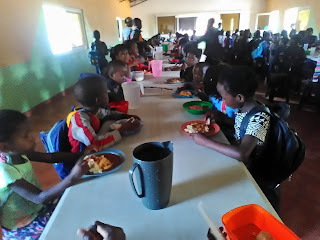 It’s the Feeding Program in Santa Luisa Marillac School in Manjangue! In this project ALG assures a nutritious hot meal and drinkable water to 900 children from the 1st to the 7th grade, 46% female students. Every week day our dear cooks work hard to deliver a delicious lunch to all the students. ALG is proud in offering work opportunities to the local community contributing to the development of Local and Family Economy. Between giant pots and pans our cooks, Mamas Angelica and Mama Sandra, keep the good mood. Lunch is ready for ALG children!